Passion is not a Word but a World in itself.. It brings the best from the self.. Passion is not a Reaction but an all out Action.. It sees no bounds and brings every Emotion. 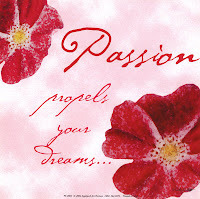 Passion is not just a Thought but an Instinct.. It withstands all and none can Resist. Passion, Passion and some more Passion..
Its all I have and let their be some more Passion. Nice poem... Passion is the best virtue, to be possessed,in this world. It lets us dream of something & aim high.Dreams make life beautiful & worth living..It always gives courage to achieve best from self & best from the world..
because Life’s other name is Passion too.. my fav. line is “It sees no bounds and brings every Emotion”.. there are beautiful poetry’s coming from your hand.. I appreciate them all and cannot do else then smile :)..
blessings to you on your efforts..